As mentioned in the table, PLAST is capable of directly working with Fasta files. However, in the context of the reference databank, you can also provide a databank name when you have made use of KDMS (Korilog Databank Manager System) that is provided with KlastRunner. Such a databank name can be obtained by having a look at the KDMS graphical frontend: on the right panel, have a look at the column called “Name”. 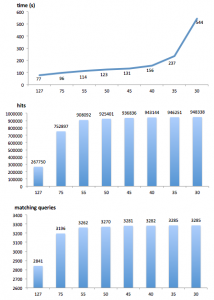 -max-hit-per-query set the maximum number of hits aligned to a query. Default value is 10. -max-hsp-per-hit set the maximum number of HSPs reported for a hit. Default value is 1. If you want to get all possible hits/HSPs, simply pass 0 (zero) to -max-hit-per-query and -max-hsp-per-hit. -a Number of cores. Default is the maximum number of cores available on the computer running PLAST. PLAST provides additional parameters to fine tune speed/quality ratio, as explained in the coming sections. PLAST’s default configuration has been setup to provide an optimal ratio between speed and quality in order to produce results with quality similar to Blast. Even in such a configuration, you’ll have great speedup factors. Depending on your needs you can enhance speed factors with little loss of quality in your results. -s Ungapped threshold trigger a small gapped extension (see comment, below). [25..127], default is 38 and 55 for protein-based and nucleic-based comparisons, respectively. Increase value to speedup algorithm with little loss of quality. Fine tuning seed-ratio, threshold score and max-database-size may provide impressive acceleration of the KLAST comparison engine, with little loss of quality in the results. Carefuly read the following sections. In order to tune PLAST correctly, we always invite our users to try the software with sample data sets. When you need to compare large set of sequences, always start your work by comparing a small subset of your data. This way, you can check the parameters, the results and the speed of the software. 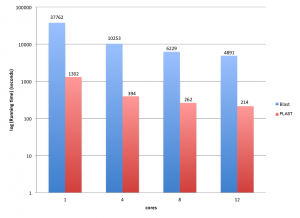 As an example, if you have to compare 300,000 sequences against NCBI nt, start your work by comparing 300 query sequences against NCBI nt using default PLASTn parameters. 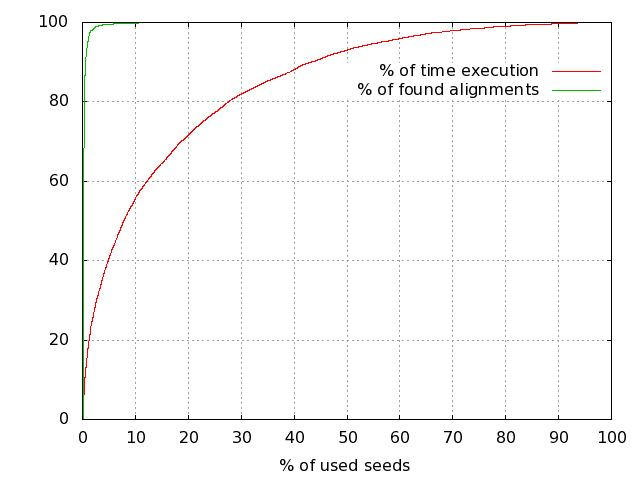 Then, fine tune it (see below the use of seed-ratio, max-database-size and threshold score) and check the results. As soon as your parameters are fine, go ahead with 3,000 and/or 10,000 query sequences, and check results and speed. If everything is fine, then run the full comparison. 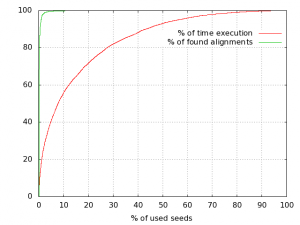 Reducing number of seeds to use during a comparison still provides high results quality while dramatically reducing search time. The seed-ratio parameter is available for PLASTp, PLASTx, tPLASTx and tPLASTn. When using PLAST from the command-line, use argument “-seeds-use-ratio value”, where “value” is in the range 1..100 (default is 100). A second way to fine tune PLAST, and speedup the search, consists in using the ‘threshold score’ parameter. During a search, PLAST computes a score for each ungapped sequence alignment matching a query and a hit. As soon as this score is above the threshold, that alignment is retained for further processing. By default, this ‘threshold score’ (‘-s’ argument) is set to a small value (38 for protein comparisons, 55 for nucleotide comparisons) to let PLAST be as sensitive as possible. However, if you suspect that your query sequences may be closely related to the reference databank, you could increase the ‘threshold score’: PLAST can still produce high-quality results, but with an additional speedup. As an example, when comparing 900 reads (500 nucleotides on average) against Silva SSU databank (740,000 sequences) on a 8 cores Intel-Xeon based computer, search time was 73 hours using “-s 55”, but only 8 minutes using “-s 127”; results were the same in terms of quality, i.e. 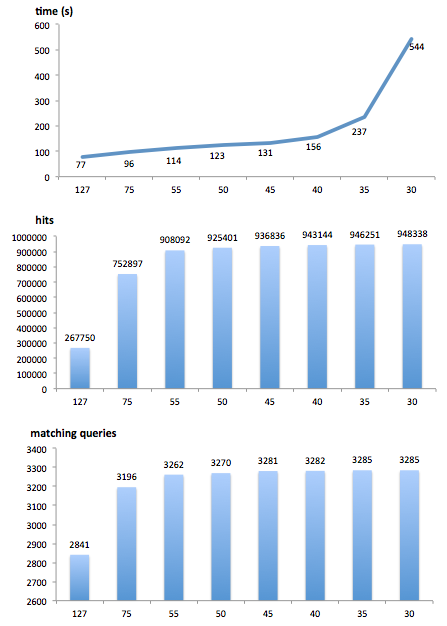 we got the same best hit for each query in both results. The threshold score parameter is available for PLASTn, PLASTp, PLASTx, tPLASTx and tPLASTn. When using PLAST from the command-line, use argument “-s value”, where “value” is in the range 25..127 (default is 38 and 55 for protein-based and nucleic-based comparisons, respectively). Another way to fine tune PLAST, and again speedup the search, consists in using the max-database-size parameter. It sets the amount of bytes to reserve in RAM in order to load databank pages into memory. Indeed, during the comparison of query vs. subject databanks, PLAST automatically paginates databanks if they do not fit entirely into RAM. For that purpose, PLAST relies on the max-database-size parameter; when setting up that parameter, compare the amount of RAM you have in your computer with ‘max-database-size x 8 x 2’ (each databank index requires ‘8 x max-database-size’ bytes, and you have two databanks). For instance, when using PLAST on a 32 Gb computer, increasing max-database-size from 20M (default value) to 100M may produce an additional speedup of 4x. We advise you to setup the max-database-size value to enable the full load of the query databank into memory. For instance, if your query file sizes 12 Mb, then set the max-database-size parameter to 15000000 (15 Mb). Also, we do not recommend to set max-database-size to value above 100000000 (100Mb) ; in such a case, if your query file is very big, let PLAST paginates the query, or run several PLAST jobs, each of them processing one partition of your query file. The max-database-size parameter is available for PLASTn, PLASTp, PLASTx, tPLASTx and tPLASTn. When using PLAST from the command-line, use argument “-max-database-size value”, where “value” is a number of bytes (default is 5000000). PLAST arguments related to score matrix, gap costs and match/mismatch are presented in the following table. Argument -m (matrix) is only available for proteic-based comparison methods: plastp, plastx, tplastn and tplastx. Arguments -r and -q (match/mismatch) are only available for plastn method. Arguments -G and -E (gap costs) are available for all comparison methods: plastp, plastn, plastx, tplastn and tplastx. Notice: in the following tables, (*) denotes the default value used by PLAST when you do not use a particular argument. [1/1] Pagination of reference databank. If reference databank fits in RAM at once, a single page is used to compare query and reference banks. time […] Three execution times are provided: ellapsed, remaining and total. It is worth noting that “remaining time” is always a predicted value. Using PLAST on the command-line.